Tranquil to Thrilling: Water Adventures Around the World! It is said that water has healing powers, which perhaps is one of the main reasons so many enjoy it. During the summer months, people flock to water for some fun in the sun and a break from the heat. Water adventures are great because they can be done individually, or with a group, and can include most all age ranges. Whether your definition of having fun is taking a relaxing canoe ride on a lazy river, river rafting in Class V rapids or learning how to kayak, there is an activity for everyone. This post focuses on three popular water activities available in much of the world: white water rafting, canoeing and kayaking. We have asked some of our fellow travel bloggers to share one of their favorite experiences with one of the three activities. Check out our stories and tell us about water adventures you have had, would recommend and would like to try! Banos is known as the ‘Adventure Capital of Ecuador’ with its’ mountains, active volcanoes, world famous hot springs and rivers that are perfectly designed for rafting to suit all levels. Our last day in Baños we tried our hand at white water rafting and booked a day trip through our hostel. After being kitted up and finishing the safety briefing, an English, Irish and 2 Chilean guys attempted to tackle the rapids of Baños. The river provided us some challenges and at times our boat was completely battered by the rapids and all of us just about holding in and just about managing to stay in the boat but there were other times when the river slowed and we were able to relax and enjoy the amazing scenery, It was the perfect place for my first rafting experience and I am extremely keen to give it another go and would highly recommend Banos & rafting in Banos to anyone! The Tulley River is a grade 4 river situated in Queensland, Australia. Seasoned adventure-seekers love exploring these challenging rapids and beginners have the option of purchasing a white water rafting package. There are also places around the water to go cliff jumping and actually swim through some of the rapids! 4. Savored Journeys – Elaho and Squamish Rivers, Whistler, B.C. Whistler, British Columbia, is known for more than just its world-class skiing. It’s also an incredible place to go whitewater rafting. Although I’m just a beginner at rafting, we were able to go out on a day-long excursion with Wedge Rafting in Whistler, where we spent the day tackling Class III and IV rapids on the Elaho and Squamish Rivers. It’s not too crazy of a river – there are harder, more demanding rapids, for sure – but with rapids that have been named Devil’s Elbow and Steamroller, it was plenty challenging enough for us! I went on this rafting trip with my family, so we filled up one whole raft and it was great fun dodging and leaning with the rapids, getting soaked from the churning water along the way. One of the best parts of the rivers near Whistler is the immense natural beauty you witness along the way. There are snowcapped peaks, dense forest and lots of wildlife to spot along the way, when floating through the calmer parts of the river. We were lucky enough to spot a black bear along the banks. The best time to go rafting in Whistler is in the summer, from June to early August. That’s when the rapids are at their highest from the winter snow run-off. “River Ganga (Ganges) forms after its confluence with various rivers, e.g. Alaknanda, Pindar, Mandakini, etc. and hits the plains at Rishikesh after flowing through the narrow valley of Himalayas from Devprayag. Its path is not smooth since it is moving from mountains to plains. 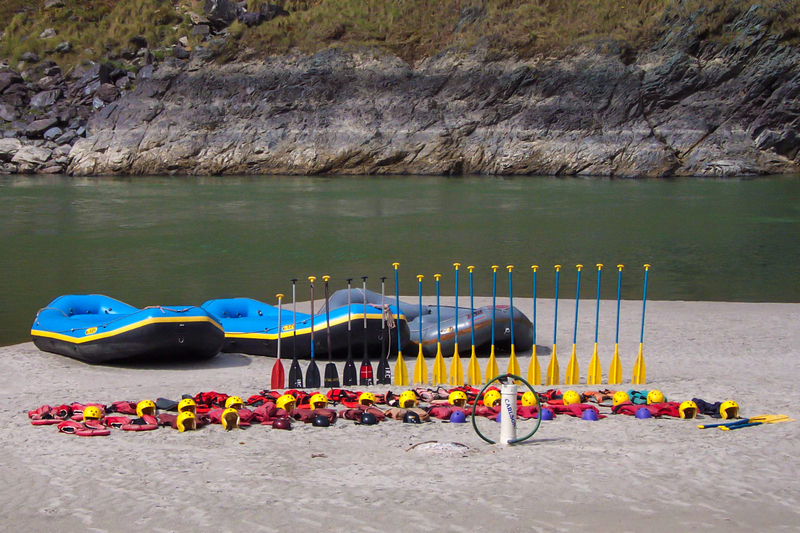 It is between Devprayag and Rishikesh that we did rafting on this river, but closer to Rishikesh. The entire normal rafting stretch here is about 24-25kms (15 miles)and takes about 4.5-5 hours, but you can choose your starting points. We had selected Shivpuri as ours. That was a total rafting distance of 16kms (10 miles) and the time duration for rafting this stretch was about 3-3.5 hours. “The rapids are mostly between grade I and III. These have been colourfully named – three blind mice, roller coaster, golf course, black money, etc. These names also have something to do with the nature of the rapid, like ‘golf course’, a grade III rapid has nine ‘holes’ or obstacles. The entire stretch was a constant adrenaline rush and we had to constantly be on guard for the unseen. But, this adventure is termed mostly safe, provided you follow instructions of the rafting instructor and paddle/stop paddling when he asks you to. “I have been rafting on this stretch 3 times. Each time has been as exciting as the first time. I would highly recommend this trip to all water-sport enthusiasts as Ganga rapids, though relatively safe, come with their own brand of difficulty! We went white water rafting with Wild West Rafting in Gardiner, Montana. Gardiner is located at the North Gate of Yellowstone Park, which makes it a fantastic option if you are staying in the area. They offer a variety of water adventure options, but we choose to do the half day white water rating trip. It was a 2 hour trip down 8 miles of the Yellowstone River with mostly Class III rapids. Rapid classes vary due to shifting water levels. They also allow children 4 and over to go, which is convenient for families. We had a large group, so we were split between two boats. All of the guides our group had were very friendly and knowledgeable about their job and the surrounding area. We all had a great time, it was one of the highlights of our week in Yellowstone! Being travelers, we are always on the look out for the next trip we are going to take and dreaming of lands far off that sometimes we forget about just how great the area we are from truly is. So this year we have decided to explore this great region we call the North Shore of Massachusetts. Our first adventure? 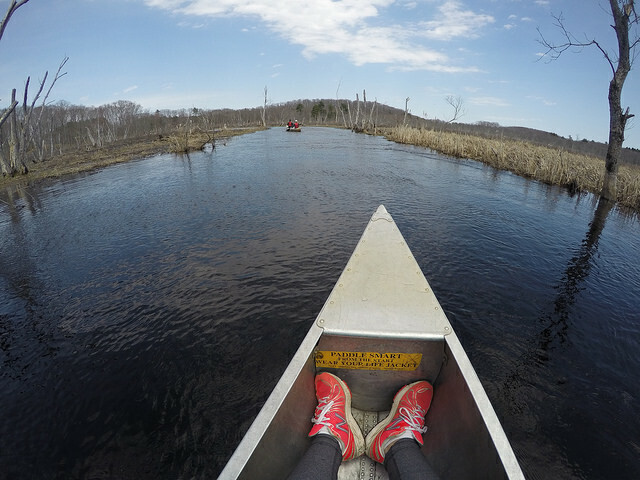 A canoeing trip down the Ipswich River in Ipswich, Ma. With lunch packed we headed down the gorgeous Route 133 to downtown Ipswich. From there we were off to Foote Brothers Canoes & Kayaks. With our life jackets in hand we hopped in the van for the 10-minute drive up river. Once launched from shore you began to realize just how pristine the area you are canoeing in. Being part of the Mass Audubon Society, The Ipswich River is a wildlife sanctuary. The river snaked past busy beavers in their dams, red winged black birds shooting through the sky and lots of changing landscapes. With numerous feathered friends singing their song to us through the trip we were sad to see it come to a close. Four hours of canoeing went by in a flash and leaving us wanting more. With such a great time behind us we can’t wait for the next adventure discovering all that home has to offer. And sometimes you guide a group of kids…. A few years ago I worked as a counselor at a camp just outside of Calgary in beautiful Kananaskis Country. One of the activities we would regularly lead the kids in was canoeing. Though with kids being kids (and counsellors being adults) more often than not this turned into a water fight. This was generally aided by the buckets that we provided and the games we played – one was called “Sink the Swiss Navy”. You can imagine what the aim of that game was. A lot of canoes sunk and even more humans had a lot of fun. I’ve been living in Italy for almost 3 months. In those three months, I have visited to a lot of countries, but just recently began to explore Italy. I had been focused on visiting countries that border Italy, not taking the time to see “Italy” When my friends mentioned Lake Garda, I was not interested because I kept thinking what could be so great about a lake! As it turns out, I was suprisingly mistaken! 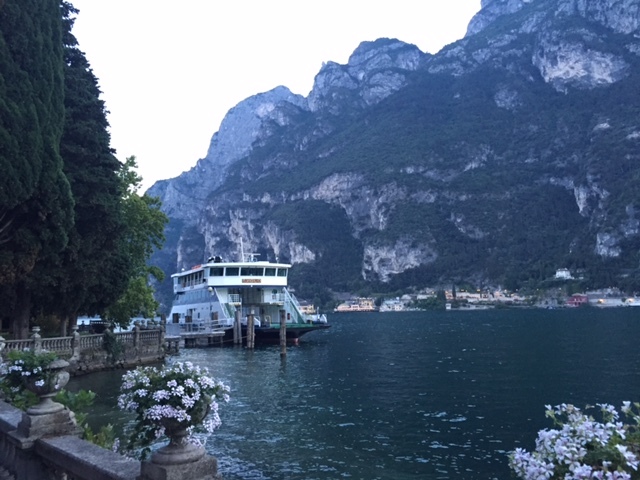 I agreed to go to Lake Garda with some friends that invited me on a recent weekend…#stayhomeforwhat! It was only about an hour drive from where I live and 5 euro in tolls. Once we arrived, I immediately understood why people love this place. It is absolutely amazing!!! This is not your ordinary lake; it is by far the biggest I’ve seen. There are an abundance of activities to choose from in the area, such as water sports, biking and canyoning. For the time we had availble, we chose to go kayaking. We rented the kayaks from At Sailing Dulac, which only costs 9 euro for a single and 14 euro for a double. This was my first time kayaking, so I asked a friend to double up with me. That decision was probably the worst idea of the day! It only took us 15 minutes to decide it was harder with two people instead of one because we were not going anywhere! The single riders that were with us……I swear, reached the other side of the lake and came back before we left the lagoon!! However, there were advantages to going so slow. We had more time to relax and enjoy the scenery. We were able to take in the beautiful mountains that surround the city, the city landscape and the beautiful blue, not grey, but blue water. The wind was blowing perfectly as we watched people around us windsurfing, sail on catamarans, go dinghy sailing, free sailing and kayaking. It was simply perfect! I recommend visiting Lake Garda on your next trip to Italy because of the wide options available in the surrounding area. The area provides the perfect setting for individuals wanting a relaxing day for laying out as well as the more adventurous types. While there, make sure to visit the nearby villages and take advantage of the great shopping and restaurants and wineries available. #Love the Life You Live! The Seattle area is best seen from the water: sailing, on a ferry, or on a kayak. Just short drives from the city are countless islands and bays to explore. Across the Puget Sound are the Olympic and Kitsap Peninsulas, which are dotted with lakes and waterways, ready to be paddled. Olympic Peninsula – One of our favorite places to kayak is the Quileute River in La Push. The mouth has a marina to put in and the river itself is shockingly calm. Due to the shallow nature, there are no other boats of any sort, so the river is all yours; your bow is the only thing making ripples. And since the mouth is brackish, watch for flounder, salmon and the occasional otter. Lakes Crescent and Cushman are two other places to paddle: stumps, elk and mountains around every bend. Beautiful. 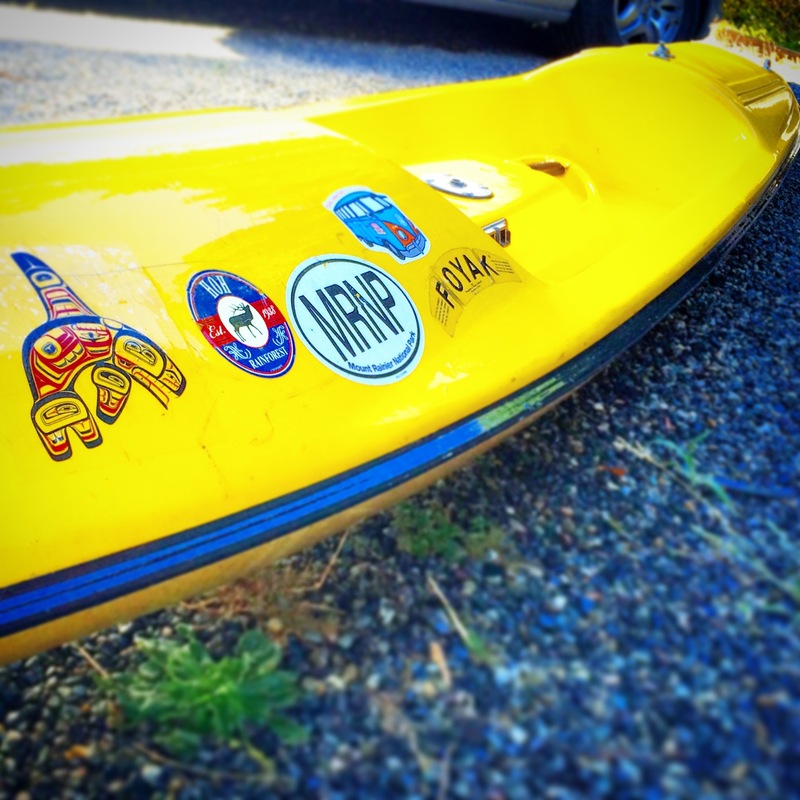 Kitsap Peninsula – Another favorite paddling haunt is the Agate Passage and Liberty Bay, separating Bainbridge Island from the Kitsap. The gradual shorelines of both sides make for easy pullouts and fantastic wildlife viewing. Without trying, I’ve seen otters swimming, heron and eagles swooping down and I’ve been stalked by a harbor seal. Living right off the Agate Passage, I know the flow of larger boat traffic, so am careful to paddle at the right time. Example: Fridays there is a small cruise ship that takes visitors to the Scandinavian village of Poulsbo, so I know to stay off the water so the wake doesn’t send me swimming. I also know that kayaking on the sea means fighting a tide, so planning trips to flow with the tide is important. If you’re visiting the Pacific Northwest without your own kayak, they can be rented almost anywhere, and truthfully, you’re not going to have a bad view wherever you paddle. Now that we have shared our stories, we would enjoy hearing yours!